The euro is the form of money for the 19 member countries of the eurozone. It's the second most widely used currency in forex trading after the U.S. dollar. It's also the second most widely held foreign exchange reserve used by central banks. As of the fourth quarter of 2018, foreign governments held $2.2 trillion compared to $6.6 trillion in U.S. dollar reserves. The International Monetary Fund reports this quarterly in its COFER Table. Like the dollar, the euro is managed by one central bank, the European Central Bank. But being shared by 19 countries complicates its management. Each country sets its own fiscal policy that affects the euro's value. 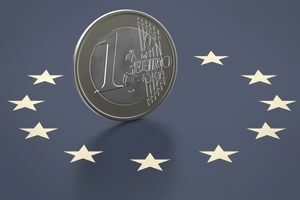 The euro was initially proposed to unify the entire European Union. All 28 member nations pledged to adopt the euro when they joined the EU. But they must meet budget and other criteria before they can switch to the euro. These were set out by the Maastricht Treaty. As a result, nine EU members have not adopted the euro. As of 2018, they were Bulgaria, Croatia, the Czech Republic, Denmark, Hungary, Poland, Romania, Sweden and the United Kingdom. The euro symbol is €. Euros are divided into euro cents, each euro cent is one one-hundredth of a euro. There are seven denominations: €5, €10, €20, €50, €100, and €500. Each bill and coin is a different size. The bills also have raised print, while the coins have distinct edges. These features allow the visually impaired to distinguish one denomination from another. There are 23 countries that use the euro as of 2018. The eurozone consists of 19 members who are EU members and use the euro. They are Austria, Belgium, Cyprus, Estonia, Finland, France, Germany, Greece, Ireland, Italy, Latvia, Lithuania, Luxembourg, Malta, the Netherlands, Portugal, Slovakia, Slovenia and Spain. The non-EU countries are Andorra, Vatican City, and Monaco and San Marino. Fourteen African nations peg their currency to the euro. They are former French colonies that adopted the CFA franc when France switched to the euro. They are Benin, Burkina Faso, Cameroon, Central African Republic, Chad, Republic of Congo, Côte D’Ivoire, Equatorial Guinea, Gabon, Guinea-Bissau, Mali, Niger, Senegal, and Togo. Iran prefers euros for all foreign transactions, including oil. Iran is the world's fourth-largest producer of oil. It has converted all dollar-denominated assets held in foreign countries to the euro. Traders base their assessment on a number of factors. These include central bank interest rates, sovereign debt levels, and the strength of the country's economy. The ECB website provides the current exchange rate for the euro. When the euro launched in 2002, it was worth $0.87. Its value grew as more people used it through the years. It reached its record high of $1.60 on April 22, 2008. Investors fled from dollar-denominated investments during the near-bankruptcy of investment bank Bear Stearns.